Cooking With The Kids: Peachy Keen! Now that the kids have mastered great ice cream, it's time to move on to frozen yogurt. It kills me to pay $3 per person each time we go to Golden Spoon, considering their cost is .25 cents a serving! Now there's a nice profit margin, along with a hefty serving of artificial flavor and color. One of the kids' most loyal readers (besides their grandfather) is April from Abby Sweets. She requested that the kids try something with peaches - so Sabrina immediately thought of peach frozen yogurt! 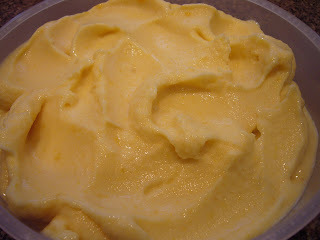 After a quick online search, we found a great, easy recipe on makeicecream.com - now, since fresh farmers' market peaches don't exist here, we had to use canned. The verdict? Sadly, neither Sabrina nor Alexander liked it. Me? I think it was amazing. Perfectly peachy, cold and refreshing - I had a small cup for breakfast! (c'mon, it's fruit and yogurt!) This will definitely help beat the heat - and there's no shortage of that now! Combine sugar, gelatin and milk in small saucepan - let stand 5 minutes for gelatin to soften. Place over low heat, stirring, until gelatin dissolves - about 3 minutes. Remove from heat and stir in corn syrup. Allow mixture to cool. Puree peaches in food processor and add to gelatin mixture along with the yogurt and vanilla. Stir well, then chill for at least 8 hours. Process according to the manufacturers instructions on your ice cream maker. Thank you, Thank you for the peach yogurt! I just bought some peaches from the fruit and berry patch and will try this one out!